I spotted these products in Superdrug and I was pretty intrigued so I went ahead and bought a few of them. First I will be reviewing the mousse! Mousse is a product which I have had a love/hate relationship with in the past. As my hair is long and wavy, I like the way that mousse tames my hair a little bit and sets my curls in. However, I hate how it can make the hair crunchy and sticky. 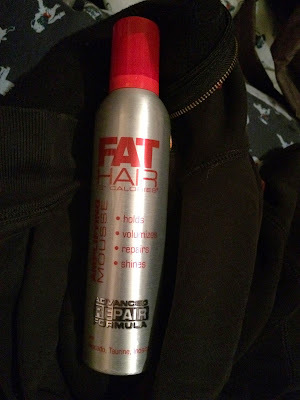 I like my hair to be touchable and soft and mousse kinda destroys that - my hair tangles easier with mousse too. This mousse claims to repair the hair due to the inclusion of taurine, inositol and avocado extract. I love the idea of hair styling products which actually condition my hair and help it to stay healthy. I think my expectations for this mousse were too high though as it's pretty sticky. I imagined it to be a dream to use but it's not really. It makes my hair look cute like all other mousse though. Perhaps the conditioning ingredients will have beneficial long-term effect ... hopefully! I would recommend this is you need new mousse as it works well. Don't expect anything extraordinary though as it's just regular mousse really.